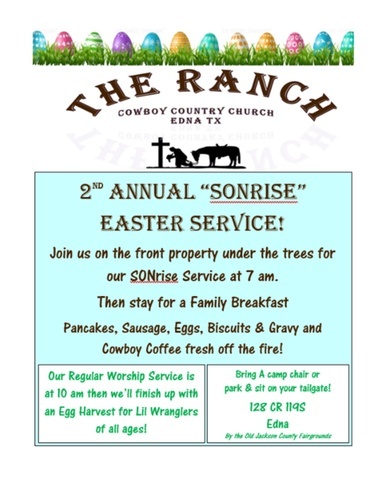 The Ranch Cowboy Country Church 2nd Annual "Sonrise" Easter Service! Name: The Ranch Cowboy Country Church 2nd Annual "Sonrise" Easter Service! 2nd Annual "Sunrise" Easter Service! Join us on the front property under the treesfor our SONrise Service at 7 am. Pacakes, Sausage, Eggs, Buiscuts & Gravy and Cowboy Coffee fresh off the fire! Egg Harvest for little wranglers of all ages! Bring a camp chair or sit on your tailgate!